Holwell Sports bagged three vital points in their basement battle with fellow strugglers Huntingdon Town at Welby Road on Saturday. Neil Miller’s men started the day level on points with the visitors and just a single point above the bottom three. But after an early setback, Holwell showed good composure to come back and claim their sixth United Counties League win of the season. 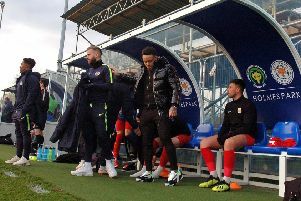 Holwell have been prone to conceding early goals this season, and once again they found themselves a goal behind when they carelessly conceded possession near their 18-yard line. As the ball was played into the danger area, Marcin Dobrzanski was alert enough to give the visitors a first-minute lead. But importantly, the lead was short-lived as the hosts replied with a goal of real quality after eight minutes. Michael Stevenson’s delightful reverse pass found Liam Ambrose free to sidefoot home. Play was even as both sides failed to find the right pass once they got into the final third, and half-time arrived with the sides level. Holwell broke the deadlock five minutes into the second half when full-back Kieran Lane went on a powerful run, and after a one-two with Stevenson, beat keeper Daniel Smith with a fine finish. Holwell then managed to squander some gilt-edged chances to put the game to bed, and with Huntingdon still posing a threat on the counter, the home side had some anxious moments. And they had to wait until the 85th minute to ease those nerves when they were awarded a penalty which the visitors complained strongly about to referee Bullen. Stevenson kept his composure to confidently stroke home the spot-kick and ensure the win. Holwell stay 16th, but moved four points clear of the bottom three and within two points of St Andrew’s in 13th. On Saturday, they travel to mid-table Rushden and Higham who have lost their last two to the two Lutterworth sides. Kick-off at Hayden Road is 3pm. Holwell: Challis, Clark, Bitmead (c), Dunlop, Lane, Peberdy, Mike Hendey, Ambrose, Harris, O’Grady, Brookes, Matt Hendey, Gaskin, Hazeldine.